A friend of a friend even wrote a Facebook note (people still write those?) about my plans, saying that I was either incredibly brave, or incredibly naive and ignorant. In the end he applauded my willingness to put myself in harm’s way in order to experience a place with real sexism, which he took to be some sort of feminist statement about being a woman in America. What?! Sorry to disappoint, but really I just wanted to see Persia. I mean, Iran is home to one of the world’s oldest civilizations, hosts nineteen UNESCO World Heritage Sites, and boasts beautiful landscapes stretching from dense rain forests to snowcapped mountains to desert basins. Plus, so many backpackers whom I met in Central Asia absolutely raved about their time backpacking through Iran. 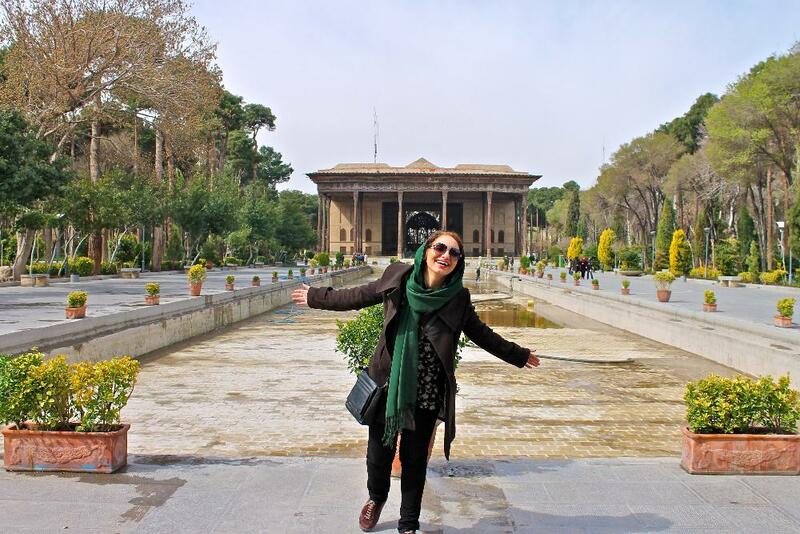 The hospitable people, delicious food and historic sites – how could I not add backpacking Iran to my travel itinerary? So, was backpacking Iran solo a good decision? I’ve now been in Iran for a week and a half and, like most places, it’s not exactly what I had imagined. I’m writing this from my new friend Mina’s apartment, where we’re huddled together with hot mugs of tea listening to loud explosions coming from the street. Every few minutes a particularly large explosion will light up the apartment and we’ll look at each other with a mixture of fear and awe. You guys, it’s the Persian New Year! As part of the “Nowruz” New Year’s celebrations, which are Iran’s biggest of the year and include Zoroastrian rituals and traditions dating back 3,000 years, on the last Tuesday of the year, families gather together in celebration, building bonfires to run around and jump over, lighting off firecrackers, and sending fire lanterns into the sky, all with random outbursts of song and dance. Backpacking Iran: Celebrating Nowruz in Tehran! Earlier in the evening while we were all on the apartment building’s rooftop, Mina’s brother joked that this is probably every American’s nightmare of Iran. He was joking of course, but there was a sad element of truth to his words. My first Couchsurfing hosts in Tehran, a young Ph.D. student and her roommate, said they were so excited to be hosting an American girl, and that they hope more tourists will start to come to Iran. They were incredibly warm and welcoming hosts, cooking delicious Persian food and asking me countless questions about Norway and the U.S. and foreigners’ impressions of Iran. And unlike everyone at home, they seemed to think it was totally acceptable for a solo female traveler to backpack Iran. Just saying. I really wish that I could have told them all that of course Americans are interested in visiting Iran, but I would probably have been lying. Most people whom I talked with about my trip offered me strong words of caution, with some even trying to convince me not to go, especially alone (and especially as a solo female traveler, ugh). The thing is, I haven’t felt alone once since I landed in Iran. The receptionist at my first hotel took me in as her daughter, accompanying me to breakfast and lunch and suggesting sites for me to visit, my Couchsurfing hosts were like cool older sisters, chatting with me about religion and politics as well as the plot twists of Lost and J-Lo’s divorce (I’m so out of touch), and Mina truly has adopted me as her sister, with an invitation to lunch turning into a trip to visit Esfahan and then several days with her family in Tehran. Perhaps solo female travel in Iran could be dangerous, but for me it hasn’t been an issue. I mean, even the tap water here is safe! There have been times, as in any city, when I’ve been walking alone and noticed a man walking uncomfortably close to me. Whether the threat was in my imagination or not, all it ever took was for me to move close to another woman and the guy would quickly disappear. Scary stuff, Iran. I am a dual American and Norwegian citizen, and I traveled to Iran on my Norwegian passport. You do have to dress conservatively as a woman in Iran, but you can still wear colorful, pretty clothes! Just make sure that your tops and/or jackets that you wear outside hit around your mid-thigh and aren’t low cut. And a normal scarf will work fine for covering your head – use a lightweight one in the summer and heavier scarf in the winter (and if, like me, you struggle with keeping it on your head, use bobby pins! ).